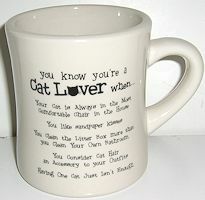 This bone colored cat lover mug says you know you're a cat lover when "you like sandpaper kisses, you clean the litter box more than you clean your own bathroom, having one cat just isn't enough, etc.". The mug is 4" high x 3 3/8" wide across the top (not including the handle). Dishwasher and microwave safe, the mug comes in its own box. This mug weighs just over a pound. It is perfect for people who like the feel of a large mug in their hand.